There are some things in life about which I have absolute conviction. One of them is bagels. I’m a native of Long Island, NY. I have a bit of a love-hate relationship with the island. There are some things I adore about it… the ocean, beaches and surfing, the wineries and agriculture of the East End, the seafood, fishing and boating, the lacrosse. And there are things I could do without… incessant traffic, overpopulated overdeveloped suburbia, people who refer to it as “Strong Island.” But one fact about Long Island is indisputable: it has the best bagels. Ever. In the world. Period. Some people say it has to do with the water. I once knew a friend of a friend, a guy from Long Island, who moved to Florida and opened an incredibly popular bagel shop. His secret? He reportedly imported his water from Long Island. Every town has at least one, if not several, bagel shops. Early in the mornings on weekends, they’ll be packed with customers waiting to take home a dozen or two fresh, hot bagels for their family’s breakfast. If you have never had a proper Long Island bagel, then I fear my attempt at describing it will fall far short of the sublime reality. First, they are boiled before being baked. This is a crucial step in the bagel-making process. They have a smooth, shiny, slightly crunchy exterior. And a moist, doughy, tender interior. They are best consumed fresh – hot straight from the oven; cooled later the same morning; or perhaps toasted the day after. That’s it. You don’t let them get stale. You don’t store them in the freezer for later. You eat them now, and next weekend, go back to the bagel shop to get more. Lox. Cream cheese. Peanut butter and jelly. Pizza sauce and mozzarella cheese. Butter. Ham and egg. Nothing at all. The Long Island bagel is the perfect delivery mechanism for any of the above. And of course, these famed, exalted Long Island bagels of which I write have one very large drawback: gluten. It’s been long enough that I can’t remember the last time I had a proper Long Island bagel, and since I was diagnosed with Celiac Disease in early 2007, I know that I won’t have one ever again. Unless I do something about it and make a proper Long Island bagel for myself. There are, of course, some gluten-free bagels to be found. A handful of bakeries, such as Mariposa, offer them. And Udi’s and Kinnikinnick sell them in supermarkets fairly widely. Of the gluten-free bagels I’ve had, though, they’ve all lacked “authenticity.” One thing or another about them just hasn’t been right, hasn’t matched up to the ideal in my mind of the perfect, quintessential Long Island bagel. And since the bagels are pre-made, and even perhaps found in the freezer section at the supermarket, you’re never going to get a fresh, from the oven, hot and doughy on the inside gluten-free bagel. All the more reason to make your own. There are, also, some gluten-free bagel recipes to be found on the Internet. Of the 6 or 7 I read, the ingredients and methods varied wildly. Many of the photos seemed to suggest a “bagel” quite different than the one I was aiming to make. 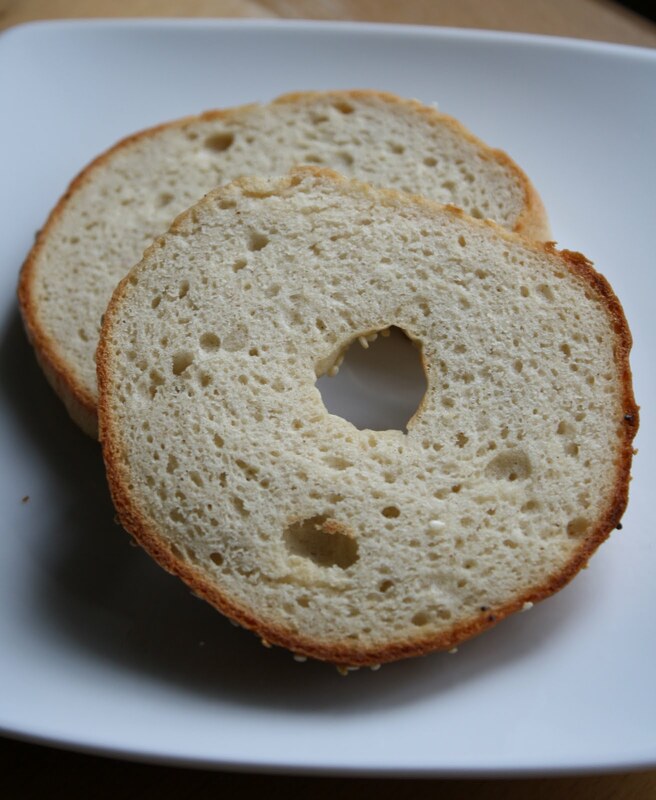 I turned my attention elsewhere…to researching authentic gluten bagel recipes. With that knowledge in-hand, I made some important modifications to make a gluten-free version, and then made many more important modifications as my gluten-free bagel recipe went through 8 rounds of recipe testing over the course of about 2 months. The results, I believe, speak for themselves. True to form, these bagels are boiled, then baked. They have a smooth, shiny, slightly crunchy outside. They have a moist, doughy inside. They are the gluten-free equivalent of a Long Island bagel. (Though I won’t go so far as to say it is exactly like a Long Island bagel…) I would put good money, though, on a wager that these will be some of the best gluten-free bagels you’ll have. I’ll admit right now so you’re not surprised – they’re a bit labor intensive. Working efficiently, it takes about 2.5 hours to go from “start” to “hot fresh bagels from the oven.” But the result is worth it. 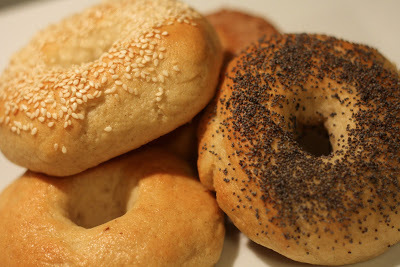 (And the bagels can be allowed to cool, then sliced, and then stored in the freezer for later enjoyment…) I tested the recipe in 4 bagel batches, but I recommend multiplying the recipe so that your time spent yields more bagels for the effort! 1. Set your oven with one rack in the middle, and one rack on the bottom. Place a deep 9X9 or 9X12 or similar baking pan on the bottom rack. Preheat to 200 deg F. When the oven reaches temperature, turn it off, and leave the door closed. 2. Meanwhile, bring a full teakettle of water to a boil. Turn off and let stand on the stove. 3. Spray a cookie/baking sheet with non-stick spray. 4. Add the 3/4 c warm water to the bowl of a stand mixer. Add the 1.5 tbsp sugar and stir until dissolved. Stir in the yeast and let sit about 5 minutes, until the yeast activates and forms a thick “yeast cake” on top of the warm sugary water. 5. In a separate small bowl, whisk together 124g (1 cup) of flour with the salt and xanthan gum. 6. Add the egg whites to the yeast mixture, and beat briefly with the paddle attachment. Add the flour mixed with salt and xanthan gum, and mix at slow, then medium, then medium-high speed until well-mixed. Scrape down the sides of the bowl with a spatula and briefly mix again. 7. Add 124g more (another 1 cup) of flour to the main mixing bowl. Again using the paddle attachment, mix at medium speed until well-mixed. Scrape down the sides of the bowl and briefly mix again. 8. Add the remaining 50g flour to the main mixing bowl. Switch to the dough hook and mix until all flour is incorporated and well-mixed, and forms a wet dough ball. Scrape down the sides of the bowl and briefly mix again. 9. Remove the dough hook, drizzle a bit of olive oil down the sides of the bowl, and toss the dough ball to coat evenly. 10. Pour some olive oil into a small cup or ramekin. 11. Liberally olive oil a smooth work surface. Turn out the dough ball onto the work surface. Olive oil the blade of a serrated knife. Cut the dough ball in half, and each half in half again, so that you have four equal quarters. 14. Dip your index finger in olive oil, then punch your finger straight down through the center of each dough disc, until you’re touching the baking sheet beneath. Then, keeping your index finger in contact with the baking sheet, swirl it in a circle to enlarge the bagel hole, until about the size to fit a golf ball. Re-olive oil your finger as necessary if it’s sticking to the wet dough. 15. Use a silicone or other brush to brush each bagel with a thin coating of olive oil. 16. These next instructions should all happen as quickly as possible: Place the baking sheet with the bagels on the middle rack of the oven. Pour the hot teakettle water into the baking pan on the lower rack of the oven. Shut the oven door. Whew! 17. Let the bagels rise in the warm, humid oven for 1 hour. No peeking! 18. When there are 30 minutes left on the bagel rise, add 2 liters of water to a large, wide saucepot. Add 4 heaping tbsp sugar (about 1 heaping tbsp per half liter of water). Cover and bring to a boil. When a boil is reached, reduce the heat to low and hold temp until you’re ready to boil the bagels. 19. Mix 1 egg white with equal parts water and whisk to make a basic egg wash.
20. When there are 15 minutes left on the bagel rise, remove the bagels from the oven and let them finish rising in a warm location, such as on the stovetop. Remove the baking pan filled with hot water from the lower rack of the oven. (Be careful!) Preheat the oven to 425 deg F.
21. At the end of the 1 hour bagel rise, place the baking sheet of bagels in the oven and “flash bake” them for 4 minutes, then remove from the oven. (This “sets” the bagels so they hold their shape for boiling.) Reduce the oven temp to 400 deg F. Flip the bagels over so they’re upside down. Turn the stovetop burner on full blast to bring the pot of sugar water to a full boil. 23. 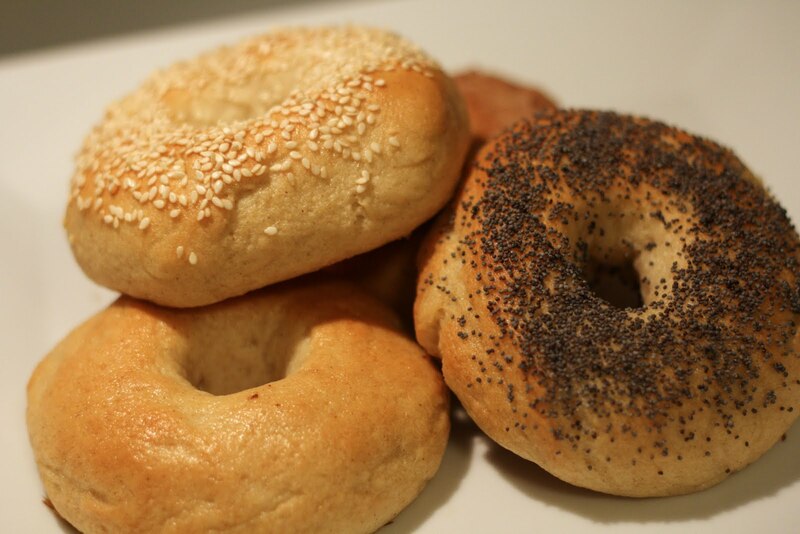 Brush each bagel with the egg wash, and while the egg wash is still wet, sprinkle the bagels with any desired toppings, such as sesame seeds, poppy seeds, or cinnamon sugar. 24. Bake at 400 deg F for about 22 minutes, until golden brown on the outside. This recipe is: gluten-free, dairy-free, peanut-free, tree-nut-free, fish-free, shellfish-free. Don’t be intimidated by the sheer number of steps in this recipe. It’s really pretty straightforward, and I include a lot of detail to give you the greatest chance for success! P.S. In the interest of bloggerly love, we’ve also posted this recipe over at Simply Sugar and Gluten-Free’s Slightly Indulgent Tuesday post. I used to love bagels and practically lived off of them in college, but I’ve yet to find a gluten-free version that meets my standards. So while this does sound rather labor-intensive, I’m willing to give it a try for the sake of having a “real” bagel again! Can’t wait to try this…I miss bagels so much!!! Thank you so much for 8 rounds of trials to get the right one! You are a man after this Long Island girl’s heart. Thank you for this recipe. I can’t wait to try it! I have had authentic Long Island Bagels and boy do I miss them. I am willing to give this a try — thanks for all of your hard work and I hope you feel better! Thanks for the well wishes, everyone! Much appreciated! Enjoy the bagels! hey mate hope youre feeling much better soon! what a week and a half eh? thanks for still giving it your all. great recipes! Oh my goodness, Pete, you were just in the hospital, have a ways to go on recovery still, and got up a bagel post??!! I am in awe, my friend! (I haven’t even gotten up my Expo post yet.) Sending you BIG BIG get well wishes! This bagels look downright amazing. I’d never heard the bit about the Long Island water before. Interesting. Thanks for the great recipe! Maybe we’ll have a bagel-themed support group meeting … hmmm, I like that idea. 😉 Sending good thoughts your way! What about adding baking soda to the boiling water? Hi Linda… Traditionally, bagels have been boiled in water that contains either sugar, barley malt, or lye. Baking soda is often used instead of lye. I only tested the recipe using sugar, so I can’t speak to the results using baking soda. If you give it a try, please report back and let us know how it goes! I have a girlfriend who makes homemade bagels (probably not with Long Island water, here in northern MN, but she does use the traditional methods. She often sends them over for the kids and I fresh from the oven, but poor Joe can only smell them. I’ll be glad to try to make him some from your recipe. Oh, yeah, and hope you are feeling better. Wow! These look amazing. Are there any ways to make these vegan and just as delicious? Hi Bella… You could almost certainly make these vegan. I like the egg whites for texture and structure in GF baking, but you could try an egg replacement (such as flax and water). I’m not sure what you’d use to sub for the egg wash at the end. And keep in mind…I haven’t tested this suggestion with this particular recipe, but it has worked in other GF baking I’ve done. Enjoy! I know what you mean about missing a really good bagel. I grew up in Cleveland and there are great authentic bagels there. I tried Udi’s bagels once, found them to be gritty/grainy. (I do like their bread though). I can’t wait to give these a try. Thanks for all you work and perfecting your recipe. Hi Janis… Glad you enjoyed the post! Enjoy the recipe! Hi AmyKathryn… So glad you enjoyed the bagels! Thanks for sharing your results with the ingredient subs! had my first attempt at making these but i dont think they are going to work. I dont think the dough was wet enough to start- my chickens must lay small eggs. I think I will use 3 next time. Then they didn’t seem to rise in the oven, but rather started to cook. The key to making these bagels successfully is having a wet enough dough. You could also start with less flour and add more if the dough is too wet. The bagels should not cook in the warm oven. Make sure that once the oven is preheated to 200 degrees that you turn it off. I hope the recipe works for you next time! Absolutely fantastic. I’m originally from Montreal (also a big bagel city) and bagels are the thing I miss the most since being diagnosed. Excellent tips on letting them rise in a hot/humid oven and flashbaking pre-boil. Well worth the effort because they trump any storebought gluten-free bagels. Hope you wouldn’t mind me linking to this recipe on my blog?